I've found two pieces of Cinadide's set, the helmet and the weapon, but they seem weaker than the gear I already have. I assume the set is worth using only when it's 100% assembled. Should I farm for it? I don't see myself compleing the remaining Ubers with my current gear. Anything I should aim to replace before I assemble the set? I think jewels and rings are my weakest pieces right now. What is hiting the wall for you ? Are you trying to do specific uber or just farm an area ? Yes, sets are best when it's 100% assembled. Some sets give good bonus with 2 parts, but not this one. Anonymous: wrote: What is hiting the wall for you ? Are you trying to do specific uber or just farm an area ? Triune, Toraja, even Fauzt is sort of hard to farm. I barely managed to do Xazax (and I have to kill him again, cause the charm rolled +0 pala), can't do Astrogha and I imagine that the rest of endgame ubers like Laz, Uldy, or the Void are way harder. Your attack rating is terrible. I hope it gets a massive boost from Incarnation or whatever that passive is that gives attack rating, cause 6k is FAR too low for those end bosses. It's at 16k with Solar Flare up. Varanthan wrote: Triune, Toraja, even Fauzt is sort of hard to farm. I barely managed to do Xazax (and I have to kill him again, cause the charm rolled +0 pala), can't do Astrogha and I imagine that the rest of endgame ubers like Laz, Uldy, or the Void are way harder. Well, i can tell you my way of doing those things. But i play a bit different style of holy melee - without dragon tree skills. Thus no incarnation and solar flare. Left over points go into dragonknight, rapture and dragonheart. To work without dragon tree buffs i use xorine rings for AR and wormtongue belt for AR and life steal. Weapon, armor - same runewords. Gloves - Kali runeword for +2 skills and some proc. Helmet - try shrine craft on circlet for +3 skills (+3 to all is better than +4 to paladin). Boots - strength craft for stats, mf and defense if possible. In total with bear stance defense goes over 500k, AR over 30k. Triune - only problem here is those kraken guards. 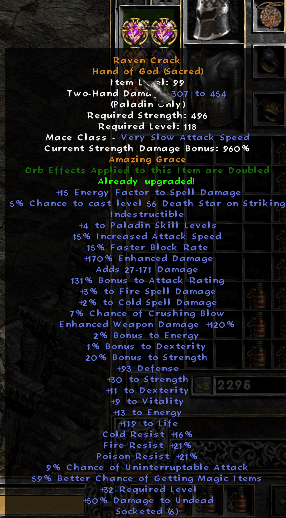 Other mobs can not kill you with enough leach + divine judgement large area. To kill kraken guards - two options: 1. stand in distance of cold spell and wait, mobs only do two things - that ice spell or walk close to you. So wait for them to start walking, go in and kill. 2. Summon endyrems behind kraken guard so it turns his back to you and go in and kill. Boss is not hard, but i hope you discover tactics yourself, learning them is good thing. Toraja - with vindicate buff you and your 1point hoplites can tank amazons no problem. Problem is amazons run away, it will take time to lure/corner them one by one with endyrems in the tight spots/corners but it's not hard. Running to Toraja was harder than uber itself. Fauzt - only problem for me is necrobots. Cannot kill them fast enough, but can ignore them while my damage is on other mobs and life leach is on. Unless you farm that venom stinger weapon - then it should be gg uber. Astrogha - was not hard either, just annoying. With free corpse in town it becomes run + damage + die + go back - repeat until success. Plus you can use sacred armor. Just remember to not have vessel working, because it might kill totems. Can try Ath runeword in paladin spear for proc on atack, but that will remove bear stance. Void - tried it once, got 5 scrolls on first try, one boss was immune to poison/physical/magic? - so i left him alone. Reached that area with many teleports and 1hit ko lazors. Died and said - gg no re. Is this weapon good enough for midgame gear? Kostetus wrote: Is this weapon good enough for midgame gear? Pretty solid, spike nova is way better but all the other stats are pretty good. If it had spike nova, could be considered endgame. Would like to see that weapon without jewels, feels like jewels are random with useless affixes on them for holy melee.